While recovering from various injuries and surgeries, patients are often recommended to go through physical therapy. Rehabilitation equipment support these therapies. Such equipment can help the survivor of the severe injuries and can make a difference in an individual’s ability to live an active and healthy life. For many people, rehabilitation equipment is key to restoring and maintaining a level of physical functions that allows independent living. They help secure the freedom of function without any dependency on others. 3. Neurological injury that affects hand. 4. Muscular injury or have gone through any muscular surgery that affects hands and arms. 5. Severe leg or knee injuries. 7. Tail bone and lower back injuries. 1. This equipment helps in relaxation of muscles. 2. They improve blood flow and circulation in the body. 3. They help in pain management and pain reduction. 4. They prevent deep vein thrombosis after surgery. 5. They help in wound healing. 7. They improve joint mobility. 8. They provide walking aids. 9. They help patient recover knee injuries. 11. Improved coordination of different parts of the body. 13. Helps in pressure injuries. 14. They have no negative or any sort of side effects. 15. They help lowering joint pressures. 16. They help in treating frozen shoulders. 17. They treat ligament injuries and pains. 18. They are apt for treating tendonitis and bursitis. 19. They help reduce weight. 20. They are apt for all age groups. b. Improves balance and stability. c.	Improves strength of muscles. d.	Improves lower back mobility. a. Help in reducing weight. b. Help in gaining strength in legs. c.	Help in increasing the activeness. a.	Restores the knee joint movement. b. Eliminates knee, hip, and lower back pain. c.	Restores knee joint stability. a. Conditions the muscles and helps preventing future injuries. c.	Helps in body toning. a. It helps the muscles to contract properly. b. Helps in getting back functionality. c.	It can reduce pain. d.	Helps improving blood circulation. a. It provides heating to soft tissues like muscles or ligaments. b. Can be used in spondylosis and cold shoulder. c.	Improves the stretching ability of muscles. 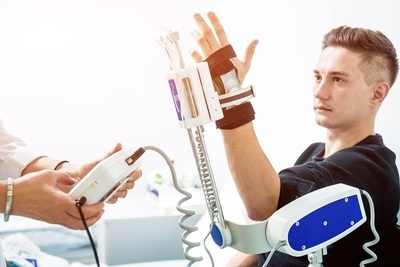 If you are suffering from any long going illness or you are a survivor of some major accident and deep injuries, then this rehab equipment will change your life for better. You must remember that any technology can never replace the need of quality rehabilitation. And, behind impressive rehab treatment is guidance of rehabilitation experts and professional, who help you face the trauma of your injury and regain your normal and active life back. Thus, if you face any such injury, do not wait to see your rehabilitation equipment expert. Reach out to the most trusted expert and get yourself best professional in the field.